New York is pure energy. 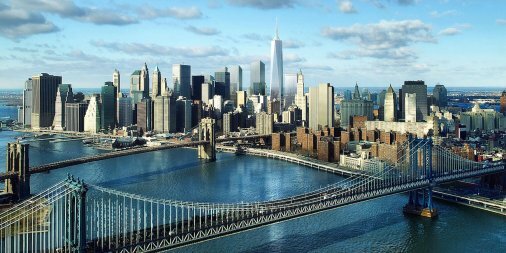 The Big Apple is home to the world’s finest museums, most diverse restaurants, top-rated music and entertainment. Infinite sidewalks lead to infinite options: café-lined streets, humbling architecture, amazing Broadway shows and the green grass hills of Central Park. NYC is the city that never sleeps! New York City Guided Tour - A great way to get introduced to the Big Apple and to learn some interesting facts, too! Empire State Building - A classic New York tourist stop. 9/11 Memorial & One World Observatory - A somber place of remembrance and hope. Ellis Island - Learn about the incredible history of our ancestors. Statue of Liberty - Lady Liberty is a must-see when in NYC. Top of the Rock - A spectacular way to take in the whole city with a 360 degree view. Broadway - The world famous stages that have delighted millions of viewers. Catch a show you'll never forget. Lincoln Center - Go behind the scenes at venues where a spectacular range of artists have performed. Tenement Museum - Discover the Lower East Side and the way immigrants helped shaped the area and its culture.